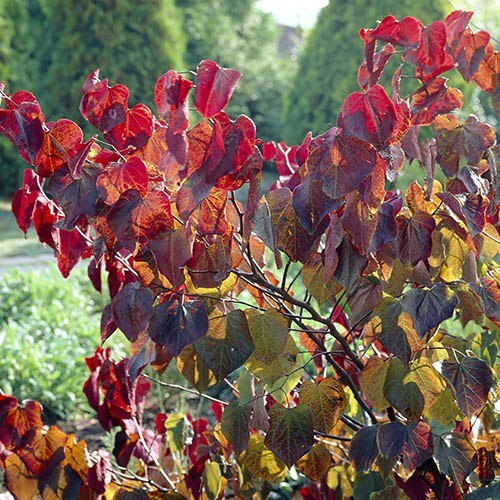 Ok, so we gave in to Martin to put this on the website, as it is one of his all time favourite small trees, as it has amazing Summer purple foliage, gorgeous pink flowers that appear before any leaves, and yet is slow-growing and easy to manage. Cercis are slow to get going in Spring, awaking from Winter slumber with small pink flower borne directly on the main stems and branches of the tree, before any leaves emerge. Suddenly, as it warms up in April, the tree is covered in the most gorgeous heart-shaped burgundy purple leaves. They colour up even darker in full sun, perhaps being more reddish in any shade. In late Autumn, they turn red to orange to green before falling late in the season. A great all-rounder, easy to manage small tree - make sure you move quickly, as we do only have a batch of 100 plants. Supplied as a 2 year old grafted bare root tree, c 60-80cm tall, to plant out Spring and early Summer.